VANCOUVER, BC / ACCESSWIRE / October 9, 2018 / MGX Minerals Inc. ("MGX" or the "Company") (OTCQB: MGXMF) (CSE: XMG) (FRA: 1MG) is pleased to announce it has signed the Definitive Option Agreement, after completing the due diligence in relation to the Memorandum of Understanding dated August 8th 2018, to acquire 50% of the issued shares of Chilean Lithium Salars SpA ("CLS"). CLS is a wholly owned subsidiary of Chilean Lithium Salars Pty Ltd. ("CLSH") and holds a 100% interest in three prospective lithium exploration Projects (the "Projects") located in Chile, including Francisco Basin, Laguna Brava and Laguna Escondida Lithium Projects. Two samples from the Laguna Brava Project were received at PurLucid Treatment Solutions Inc. ("PurLucid") facilities in Calgary, Alberta to undergo pilot testing to prepare a Rapid Lithium Extraction unit deployment. Drilling contractors will be on site this week to prepare the drilling program at Francisco Basin Project, which will be overseen by SRK Consulting to deliver a 43-101 complaint Resource Estimation as soon as the exploration program is completed. Following the positive response from the Chilean state agency National Geology and Mining Service ("SERNAGEOMIN") and the Environmental Assessment Service ("SEA"), the Company plans to ship a rapid lithium brine system shortly. The Special Lithium Operation Contract "CEOL," is a requirement to carry any lithium related commercial activity in Mining Concessions granted after 1983. 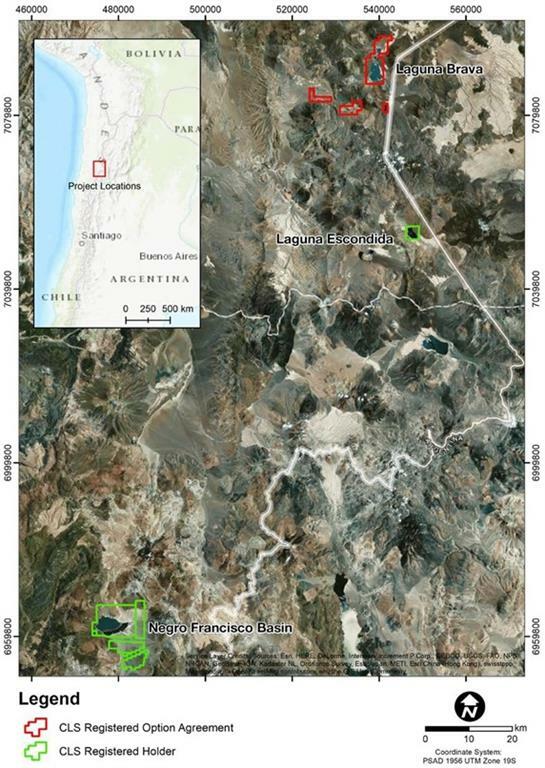 The Francisco Basin lithium project ("Francisco Basin") is located 30km south of Maricunga salar, 100 km southeast of the regional center of Copiapo and accessible via a regional highway and established tracks. The lease area comprises 12,900 hectares. Historical exploration work on the project was previously limited to hydrology studies. In January 2018, CLSH completed a reconnaissance brine sampling at the project. This sampling confirmed the presence of lithium enrichment in the surface brines. The samples were assayed at the University of Antofagasta ("Antofagasta"), Antofagasta, Chile which has one of the two leading laboratories in the world for this type of brine analysis. In May 2018, sampling continued and a 2.5L sample was taken near the southern shore of the surface Northern lagoon and sent to Servicios Quimicos Ltda. ("SERQUIM"), Antofagasta, Chile for content analysis. CLSH reported results to date are shown in Table 1. 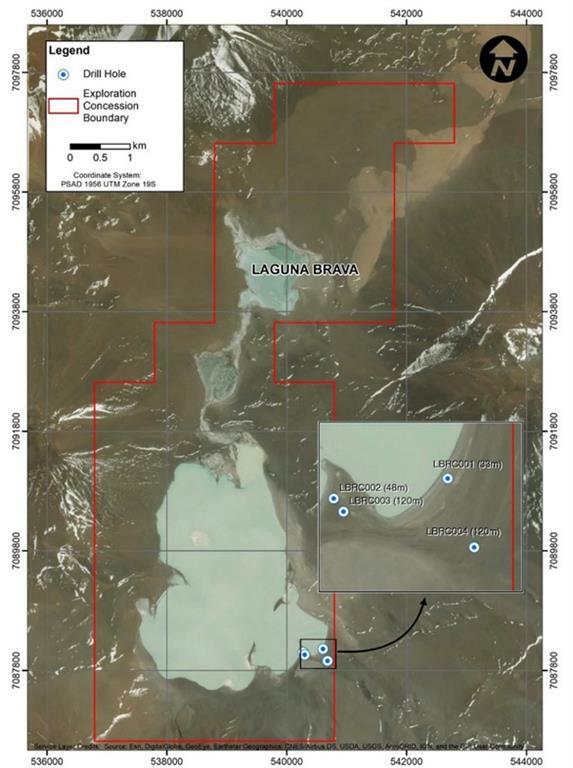 The Laguna Brava salar ("Laguna") is geologically prospective for lithium brine. The catchment is large and dominated by volcanic rocks, many of which have been altered by hydrothermal fluids associated with volcanism. The lake is also fed by active hot springs. Historical sampling of surface brines indicated significant lithium enrichment. In December 2017, CLSH undertook a four-hole reconnaissance drilling program at a southern access point of the salar to investigate the deeper aquifer. Prior to the CLSH reconnaissance drilling program in December 2017, no previous work had been undertaken to assess the volume and grade of the subsurface resource. Previous work recommended that the subsurface brines be investigated on the basis of his conclusion that Laguna Brava is geothermally fed. The presence of hot springs being present either at the margins or beneath salars is common within the Chilean Altiplano, other notable locations include the Salar de Coposa in Region I and Salar de Atacama in Region II. The principal origin of lithium in the Salar de Atacama is interpreted to be the lithium-bearing geothermal waters from the El Tatio Geyser Field, located north of the salar. The geothermal fluids enter the northern part of the Salar de Atacama via surface and subsurface flow. It has also been reported that the chemistry of the salar brines is almost identical to the chemistry of the geothermal fluids of El Tatio. The Laguna Escondida project ("Laguna Escondida") is located approximately 200 km east&#8211;northeast of the regional capital and is accessible via a provincial highway to within 10-15 km of the project.